Udupi, June 25, 2016:The Udupi DC Dr. R. Vishal, has been transferred and posted until further orders as Director of Municipal Administration in Bengaluru. Priyanka Mary Francis, CEO of Udupi Zilla Panchayat, has been given concurrent charge of the post of Deputy Commissioner of Udupi district until further orders. 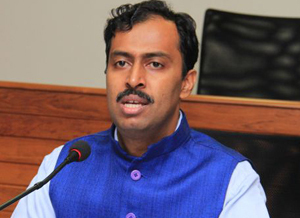 Dr. Vishal had taken charge as the Deputy Commissioner of Udupi district on November 5, 2014. Dr. Vishal stated that he was happy and enjoyed his near 2 year tenure as the DC of Udupi, a cultured and historic area. “It has been lovely, I am happy that we could plan and achieve many things in the district in different fields. The government is my boss. I have to go where they post me,” he said. Speedy file clearance : During his tenure, the speed of processing of files of Revenue Department had increased and the implementation of various infrastructure projects had also been expedited.